The author Detlev F. Neufert had a strange meeting at his village in Bernau am Chiemsee. Out of the blue a real Nat from Mandalay, Burma, approached him and asked for his friendship. Nats are spirits that live in every household in Burma. These spirits can do miracles and bad as well. 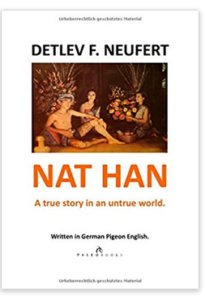 The amazing stories that Detlev and Nat went through seem to be from another reality. But they are true. The rich friend of Nat is very sick. Before he dies he wants to use the Nat-power and Detlev’s sense of reality to bring the different worlds together. The book is written in German Pigeon English that everyone can understand who can say ‚hello‘ and ‚good-bye‘.